In the year 1847 the first people came to the area known as Rhineland or Loutre Island, along the Missouri River. The area was soon to be named "Starkenburg." The settlers were Germans from the Hermann, Missouri area. They would have special services when missionaries came. In this barn was a statue, which the Germans named "Weisse dame" or "White Lady." St. Martin's Parish was chartered in 1848. The Parish was named after St. Martin, Bishop of Tours, France. One year after being charted, forty acres were obtained and a log church was built. In the year 1852, the Parish of St. Martin constructed a humble log building, which would become the new home of the "White Lady." Whenever the parish conducted a procession on the extensive church grounds, they would carry Her in their midst. This public expression of Catholic devotion attracted the attention even of non-Catholics in the neighborhood. Twenty years later, in 1872, parishioners began to replace the log church, by building one of stone. In 1873, a cornerstone was laid for a new stone church. Rock was quarried from the area. In 1873, Rev. Joseph Schaefer, the pastor, placed the White Lady in the newly erected Stone Church, St. Martin's Church. In 1874, a Gothic-style church was consecrated. There was a large bell, several statues, and stained glass windows. In 1877, the Franciscans took charge of the Parish. For a few years, the Madonna remained in the Church. Then, a larger and more elegant statue replaced it, and the former was placed in an attic. On October 27, 1887, Father George Hoehn, from Heppenheim, Germany became Pastor of St. Martin's Church. Father Hoehn was a zealous, friendly man, and the simple piety of the people at his first mass with them impressed him. He was delighted that the natural surroundings of his parish so closely resembled his homeland. August Mitsch, Father Hoehn's nephew, came to St. Martin's on November 2, 1887 to serve as a sacristan. In the year 1888, during the month of May, near St. Martin's Church and where the magnificent Shrine now towers over the hills, a dogwood bush was in its full beauty, covered with hundreds of its fragrant blossoms. In the attic of the monastery, which now served as the rectory, August Mitsch found an old, white faded statue of the Blessed Mother. This he took and placed in the midst of the flowers of the bush. A more beautiful canopy for the Madonna could not have been imagined. The addition of a few candles completed the May altar. The place of devotion was soon discovered. August Mitsch, with the aid of two students, the Rev. Fathers George Koob and Jacob Denner, built a new log hut, to replace the one built in 1852, to protect the White Lady. Hardly two persons could kneel within, the rest had to kneel outside. The number of the faithful that frequented the woodland shrine increased rapidly, and the hut was soon replaced by a small chapel, octagonal shape, which was also constructed of logs, with a small steeple to the front. Stained glass windows from Germany further enhanced it, and a bell was immediately hung in the tower. 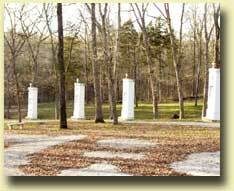 On the feast of the Seven Dolors, April 12, 1889, with the approval of Archbishop Peter Richard Kenrick, a Way of the Cross was erected in the woods. Pictures, representing the different stations were placed under glass in simple wooden cases raised on posts. The woods now received a special blessing and no cattle or vehicles were permitted to cross the premises. During Lent, in the year 1890, through the contribution of two generous St. Louisans, the parish was able to make the purchase of a "Sorrowful Mother" statue. It is a replica of the highly renowned "Pieta of Achtermann" to be seen in the Cathedral of Muenster, Westphalia. The statue is small, it is true, but a beautiful work of an artist of Dusseldorf. 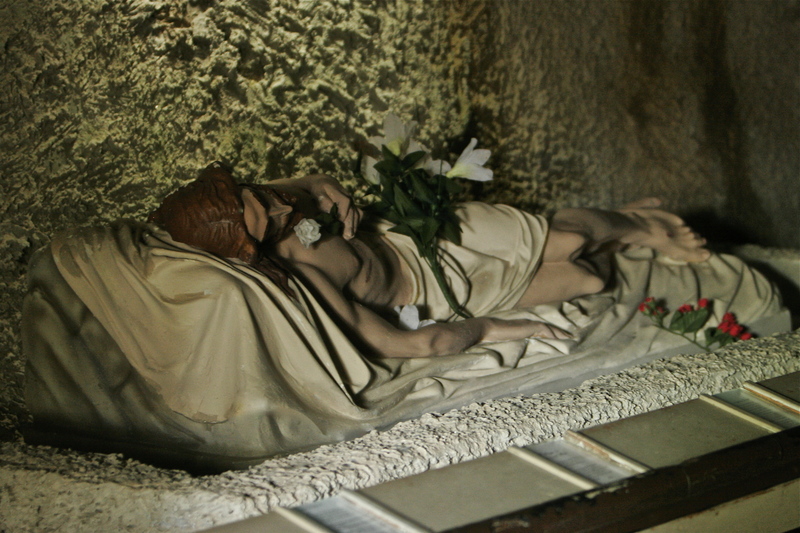 This statue was now placed in the Chapel and the original "White Lady" which was rather faded and worn by this time, was again stored in the attic of the rectory. The new statue of the "Sorrowful Mother" attracted many visitors. Multitudes came to seek comfort in their misery from the Mater Dolorosa, who in her own agony would not forsake her suffering children. Through the devotion to the Sorrowful Mother, so pleasing to Catholics, this place was showered with blessings. In 1891, it was undertaken to build an addition to St. Martin's Church, and to erect a 125-foot steeple, complete with two large bells. The work was interrupted and delayed because of continual rainfall. Due to this overabundance of moisture, destruction of the newly-ripened crops was feared. All these circumstances were unfavorable regarding a successful completion of the edifice. On Sunday, June 21, 1891, when the 300th anniversary of St. Aloysius was commemorated, the rain poured down in torrents. The weather continued for almost six weeks. Farmers could not venture into the fields to cut their over-ripened wheat. Father Hoehn remembered when many years ago, in his homeland, the region had been in the throes of a terrible drought. The residents made a solemn promise to build a chapel if their prayers for rain were answered. Rain fell, and the Chapel was built. Father Hoehn thought that if the Mother of God heard the prayers of those children, she would not ignore the voice of these, even though they desired just the reverse result. On the same afternoon, a solemn annual pilgrimage was vowed to the Blessed Virgin in the Chapel, if the rains would cease, so the farmers could work in the fields. The following day dawned bright and clear, and one beautiful day followed another. The farmers harvested their crops and the church was finished the same year without serious interruptions. The nave of the structure was enlarged. Towards the south the wall is gable-shaped. Here, the pilgrims, when still at a distance, may see a statue of the Blessed Mother with her Divine Child, raised aloft in a niche, to greet the coming wanderer. The steeple to the front of the Church reaches a height of 125 feet. The exterior appearance of the Church was greatly improved by the changes and additions made. With grateful hearts, the community celebrated a solemn Triduum on the 6th, 7th, and 8th of September, in thanksgiving for favors bestowed upon them. Nearly the entire parish received the Sacraments. On September 8, 1891, the feast of the Nativity of the Blessed Virgin, a solemn High Mass was celebrated, assisted by the Franciscan Fathers, Jerome and Maximilian, of Hermann. Two solemn processions lead to the Chapel, and devotions there were offered in gratitude for benefits obtained through the intercession of "Our Blessed Lady." Many candles were offered on that day. Religious articles, such as pictures of the Blessed Virgin, statues, rosaries, and medals were blessed. This first general pilgrimage was most edifying. Near the end of 1891, Father Hoehn applied for a post office because of the amount of mail coming into the area. He was told he had to have a name to complete the forms. Looking around at the hills and the new church steeple, he thought of the likeness to his homeland of Heppenheim, Germany and the hill rising up to a fortress named Starkenburg. Father Hoehen signed the papers "Starkenburg" and the post office and the surrounding area were given that name. Although the pilgrim processions in former times were of a more private nature, they grew more public after the solemn vow was made. The first pilgrimage made by people other than parishioners was on September 8, 1892, by the Catholics of Hermann, Missouri. A mission, conducted by two Redemptionist Fathers, was connected with the Pilgrimage. Forty outside pilgrims were present. 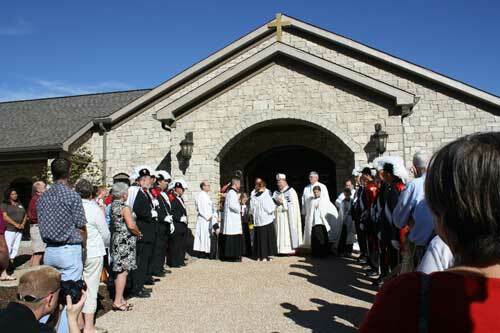 The parishioners of St. Martin's met them in a solemn manner and the procession was then directed toward the Log Chapel, where they greeted the Blessed Mother. This was followed by a Solemn High Mass in St. Martin's Church. In the afternoon, a sermon for the strangers was delivered. The celebration in the evening added to the significance of the pilgrimage. For the first time, the exterior of the Chapel had been beautifully decorated and illuminated. Rev. P. Hy. Muerer, CSSR. Delivered the sermon about the Mother of Sorrows and at the close entrusted the entire community to the special protection of Mary Inviolate. An extraordinary occurrence took place during the summer of 1894. A terrible drought prevailed. A failure of crops, due to lack of rain, seemed imminent. With full confidence, candles were burned continually before the statue of "Our Sorrowful Mother." During the night of the 24th to 25th of June, the altar in the Log Chapel caught fire. Atop it was the statue of the Blessed Virgin, adorned by her lovely veil. All the altar linens, flowers, etc., were destroyed by the blaze. Places on the altar were charred, but the statue and its white veil, held in place by a waxen wreath, remained untouched. The fire ceased to burn any further. It seemed miraculous that no damage was done, as everything was very dry at the time, and it was thought that anything once ignited would go up in flames. To the faithful, it was clear that "Mary saved her Shrine." This wonderful incident increased the devotion to the Blessed Virgin greatly. A beneficial rain soon fell to refresh the soil and a successful harvest was the result. The Chapel was remodeled so that ten people could kneel within. Many were willing to make a contribution to cover the expense of this. Mr. Henry Kruse and his son, of Americus, completed the Chapel, which now had a most inviting appearance. The Pilgrimage that year of 1894 was very inspiring. During a Solemn High Mass on the feast of the Nativity of the Blessed Virgin, the Young Ladies Sodality received Holy Communion. The following day, the feast of the Holy Name of Mary, the Young Men's Sodality approached the Communion Table. Frequent visits were made to the Chapel on both days. The general pilgrimage was postponed until September 13th. By order of the Archbishop, Peter Richard Kenrick, the Chapel was dedicated by the Pastor of St. Martin's with six other members of the clergy present. The dedication took place in the morning after a Solemn High Mass. The celebration and torchlight procession in the evening were both impressive and instructive. The festal sermon was delivered by Rev. Henry Geers of St. Louis. He stated that he envisioned the erection of a Chapel of stone to occupy the place where the smaller one was now standing. As the stories spread concerning the place of a pilgrimage and the miraculous preservation of the statue and veil from fire, pilgrims began to arrive from St. Louis, St. Charles, Dutzow, and other distant cities and towns. During the month of May 1895, when Archbishop John J. Kain administered the Sacrament of Confirmation, he delivered a most touching sermon in which he emphasized the many virtues of our Blessed Mother, the necessity of venerating her, and the blessings and benefits obtained through her intercession. He closed his sermon with the following words, "May Pilgrims come from far and near to this place, to look upon the face of that Sorrowful Mother, therein to find consolation and rest." As the number of pilgrims continued to mount, it soon became necessary to build a larger chapel. Beginning in September of 1900, Father Hoehn published a monthly magazine entitled, Der Pilger (The Pilgrim). It was written, half in English, and half in German. Collections for the new chapel began in 1902. Many of the pilgrims subscribed to the magazine, which related work in progress and plans for the Shrine. Proceeds from the sale of Der Pilger had amounted to several thousands of dollars, and this represented the beginning of the fund drive. Blueprints for the new chapel were drawn by Professor Becker of Mainz, Germany, with Mr. John Walchshauser, an architect from St. Louis. The new chapel was indeed a labor of love, a desire to build a monument fitting to honor Our Lady. In 1906, the parishioners began to quarry stone for the chapel. Soon large piles of stones were gathered from two quarries. Many participated in the manual work, which was done mostly in the winter. Supervising their efforts were John Schluess, Ben Koenig, John Pohlman, Henry F. Van Booven, Robert Elsenraat, and Frank Eikel. Donating stone from their private quarries were William Bossman, August Daller, and Gerhard Koenig. Mr. L. Van Beek and Mr. G. Overkamp donated rocks for the foundation from their hillsides. The chapel was to be on the site of the original spot where August Mitsch had placed the White Lady. The log chapel was moved on skids somewhat to the north of its present location. During the spring the men of the area transported the material for the foundation to the site of the chapel. On July 28, 1906, asking for God's blessing, Father Hoehn broke ground. The site was then leveled, and excavation for the foundation begun. The first stone was lowered on October 23 on the Feast of the Holy Redeemer, whom St. Paul called, "the beginning and cornerstone." Prayers asking for blessing of the Almighty followed a procession to the small chapel. The foundation was completed by December 6, 1906, and during the remaining winter months " the good people busily quarried stones and hauled sand," wrote Father Hoehn. Enthusiasm was so high that "many helped who otherwise did not do much and who had for years remained in the background." The cornerstone was laid on May 24, 1907, the Feast of Mary Help of Christians, by the Very Reverend O.J. Hoog. He blessed the stone and fitted it into its place on the northwest corner of the building. After the laying of the cornerstone, the work on the structure continued at a slow pace. A great deal of technical work on the structure continued at a slow pace. Much technical skill was required, yet there were no funds to hire trained men. The few skilled men who cut and fitted the stone on the spot deserve credit for sticking to their job in spite of the meager wages. Gallant workers included Bernard Scheppers and John Fork of Wardsville, Missouri; William Kolkmeyer, Henry Lammers, and Joseph Weible of Westphalia, Missouri; John Stemmer of St. Louis, Missouri; and, John A. Struttman, Walter Koenig, George Lohmann, and Adam Denner, of the parish. The winter of 1908 was cruelly severe, yet "shortly before the Holy Christmas festival, the chapel was under roof. Deo Gratias!" wrote Father Hoehn. Two more years passed from the laying of the cornerstone to the dedication of the chapel. Then, on July 16, 1910, on the Feast of Our Lady of Mount Carmel, a large copper cross measuring seven feet in length, "was fastened to the steeple of the chapel," wrote Father Hoehn with a triumphant air. On the eve of the Feast of the Assumption, the statue of the Sorrowful Mother was transferred to the side altar, Her new home in the stone chapel. The White Lady, which had been the inspiration for the chapel in the woods, was to be returned to that place. Now, painted in beautiful colors and draped in a white German robe, She was carried to the chapel. Father Hoehn relates the event: "Something touching occurred the day preceding the consecration. The old, venerable image of the year 1852, with which the pilgrimage had begun in 1888, was carried to the new chapel in solemn procession by maidens of the congregation, accompanied by priests, members of the congregation, and pilgrims. There at the entrance, it was taken from four aged, honorable matrons and carried to the beautiful marble high altar of the chapel, where it was place in the main niche." These women had carried the White Lady in procession more than 50 years before. They were Mrs. Christina Struttmann, Mrs. Helene Scholten, Mrs. Johanna Fluecht, and Mrs. Adelheid Pottebaum. The statue and the altar were then incensed, and prayers of consecration offered. The Gertken family of St. Louis donated the altar, which cost $1,500. The family saved ten-dollar gold pieces over a period of three years. An evening torchlight procession began at the Pilgrim House and continued through the woods to the Grotto of Lourdes, with the Ave Maria resounding through the trees. A short devotion was held at Mt. Olivet, and then the procession continued to the chapel. Reverend Charles Schaefers of St. Mary's in Moberly delivered a sermon in which he spoke of "Mary, the mystical rose in God's garden, a delight to angels and man." The next morning, September 15, 1910, saw hundreds of pilgrims in the church, where a High Mass was celebrated at 5 o'clock. The Archbishop J.J. Glennon, upon entering the chapel exclaimed, "You have built a really beautiful chapel!" 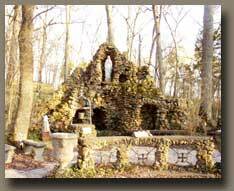 Following a procession through the woods, the archbishop entered the original chapel, donned his robes, and proceeded to the new stone chapel. Staff in hand and dressed in splendor, he was accompanied by the clergy and three of Father Hoehn's seminarians, Martin Hellriegel, John Noelker, and George Nolte. The outer walls of the chapel were blessed, while the psalm, "Miserere" was sung. The Litany of All Saints was chanted inside the chapel, and the interior then dedicated. Then, the four portals were thrown open, and the pilgrims were allowed to enter. But their numbers were so great that many had to follow the services from the terrace outside the four doors at the back of the chapel. A solemn High Mass was sung by Reverend G. J. Sudiek, pastor of St. Mary's, in Old Monroe, Missouri. A sermon in German was delivered by Reverend Henry Geers, who had prophesized 15 years earlier that a stone chapel would stand in this same spot. An address by the most Reverend Archbishop Glennon followed; he thanked all that had willingly contributed to the erection of the lovely Temple of Mary. He implored them to continue venerating Mary, Queen Immaculate. The ceremonies concluded with the St. Martin's Church choir, under the direction of Johanna Winkelmann, singing "Laudate Dominum." Joseph Highberger, who had donated the bas reliefs for the stations, now added another gift: the new bell to be hung in the chapel tower. This was dedicated on September 11 to the holy Archangel Gabriel. Mr. Highberger had made an annual trip to Starkenburg for many years and now, though frail, assisted at the dedication ceremonies. He died six weeks later, content to have heard the first ringing of the bell in the stone chapel. A small stone of the old Starkenburg fortress was brought from Germany by Father Hoehn in 1912, and was implanted into the east wall of the chapel. In 1971, a plaque was added to identify the stone. The chapel is constructed entirely of stone in the early Rhenish-Romanesque style. It is 69 feet long and 43 feet wide. Its height to the gable is 50 feet and to the right of the sanctuary the tower walls reach 67 feet. The spire, in typical Romanesque style, is short. Above the main entrance is a magnificent 12-paned rosette window. Above the window, in a niche, is a beautiful statue of the Archangel Gabriel. It was sculpted in Italy and donated by Mr. Jacob Moershel of Jefferson City, in memory of his wife, Bertha. The roof is of slate. To the front of the Shrine, adjoining the spacious platform, is a pulpit of stone. Its ironwork, in which the Evangelists are depicted, originally adorned the pulpit in the log chapel; it now graces the new pulpit so that a touch of the old merges with the new. Before entering the chapel, one sees a lovely bas relief of Mary Queen of the rosary, with St. Dominic on one side, and St. Catherine of Siena on the other. Two angels kneel in veneration. Beneath it are the words, "Blessed is the man that watches daily at my gates and waits at the post of my doors." To the left of the main entrance is the aisle leading to the altar of Our Sorrowful Mother. It looks like a small chapel of its own. Before this altar lie crutches and braces, as well as plaques of thanks, all bearing testimony to the graces received by the pilgrims through the intercession of Our Lady. One of those who placed a plaque there was a young student who noticed a growth which had suddenly appeared on his hand. He prayed and used the holy water from the Lourdes well; the growth disappeared, and never returned. The student later became Monsignor Hellriegel, who was ordained in 1914 and said his first mass in the chapel.